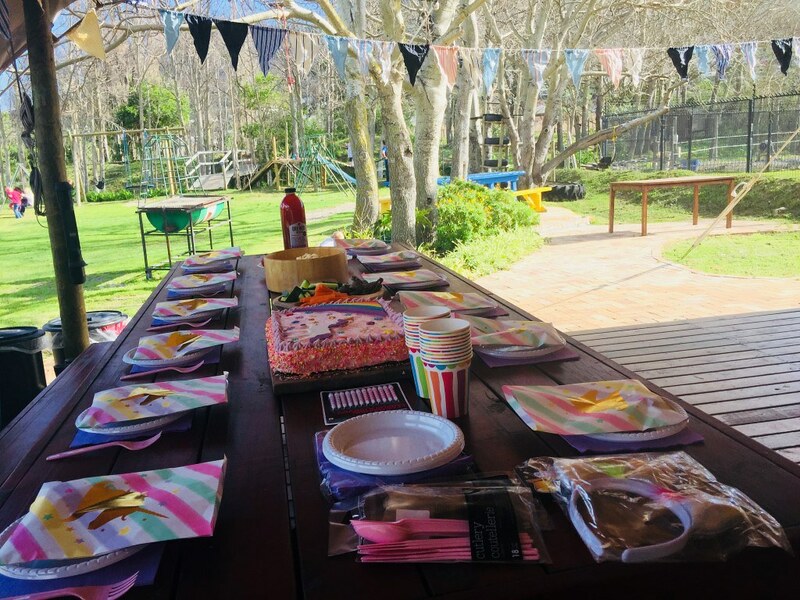 I recently had my daughter’s 4th birthday party at the Riding Centre in Hout Bay and it was by far the best outdoor party venue we have been to. I can absolutely and wholeheartedly recommend it. 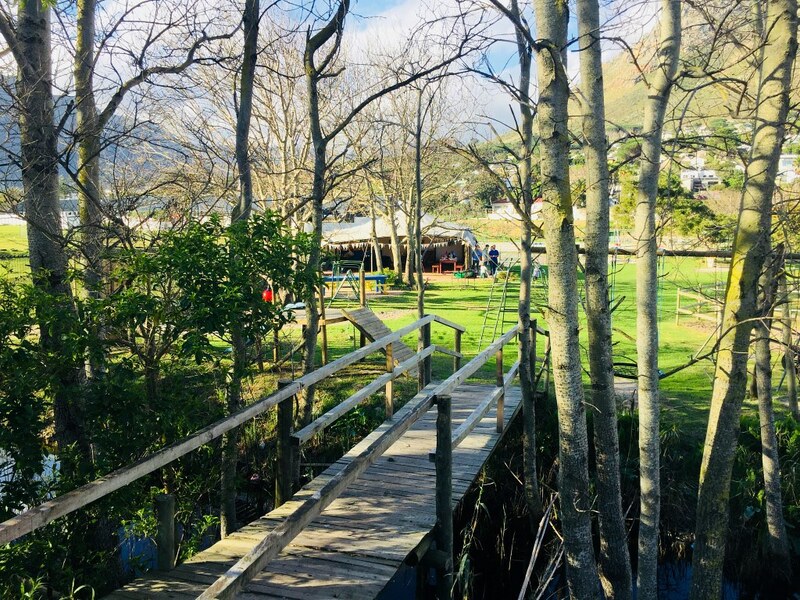 It is a beautiful setting with plenty of luscious grass, horse paddocks and two different outdoor play areas, all surrounded by beautiful mountains. The venue offers a waterproof tent that covers a wooden decking area. There is a large space with tables and sofas inside the tent as well as a power point and running water at a sink for catering purposes. On rainy or windy days the tent flaps can roll down. There are different party packages on offer ranging from self-catering, venue only hire to an all-inclusive package offering fantastic convenience. Kim, the manager is very helpful and hospitable and we felt totally at home. You have exclusive access to the tent and the play area during the party. We did not feel pressurised to vacate the area, as is the case at some party venues – we had the area from 2:30-5pm, which was ample time for all the children to play to the hearts’ content. There are two different areas on offer for parties – we chose the adventure play area that stretches across a stream, includes wooden apparatus incorporated into the trees and little picturesque bridges with climbing nets etc. The children had an absolute ball exploring all the nooks and crannies amongst the trees and the stream. The other location, called the garden playground, is a lovely grassy area with play equipment that are fenced in, making it perfect for younger children. For a small fee you can hire a couple of ponies and the children can take turns for guided rides around the arena. This was a real hit with the children. Other activities that can be organised by the venue include pin the tail on the donkey, horse shoe decorating, a treasure hunt, obstacle course, jumping castle and a water slide. A party photographer can be available at an additional cost and a party supervisor can be organised if needed. Alternatively, with it being such a wonderfully open space, you can just organise your own party games, as we did. Apart from parties, the riding centre has plenty to offer children. Guided pony rides take place daily between 9:30am – 11am (last ride at 10:45am) and 2:30 – 4pm (last ride at 3:45am). The café offers a cosy space to have coffee, snacks and toasted sandwiches. There is a large pot belly pig that wanders around the grounds as well as a goat, some geese, ducks and bunnies to entertain the children. 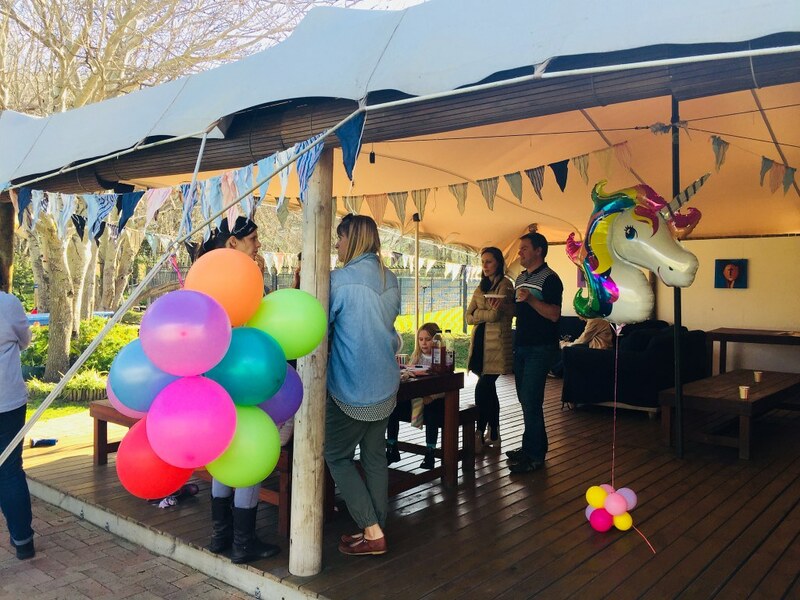 The Riding Centre is a true gem – remember it for your next party venue, but do pop in for a relaxing time well-spent outdoors with your children.